Of the many rewards of working with flower farmers, their insatiable curiosity and openness to learning are among the most inspiring. This was indeed the case at the recent Southern Flower Symposium in Charleston, South Carolina, hosted by an emerging force in the region, Lowcountry Flower Growers. For anyone interested in starting a cut-flower business, attending a regional event such as this can be a valuable immersive learning experience. Presenters included veteran flower farmer Rita Anders of Cuts of Color, of Weimar, Texas, as well Nikki Seibert Kelley of Wit Meets Grit, who moderated a panel that invited growers at various levels to discuss flower farming practices and share their wisdom. In all, symposium attendees left with renewed confidence and useful flower-growing advice specific to the Southern tier. While listening to the rants and raves of each attendee on the distinct floral cuts they grow, I was prompted to consider the best cut flowers to grow from seed for the less seasoned growers among us. I was able to take what I learned at the symposium and combine it with narrative I've gleaned from several other expert farmers. The result is a carefully vetted list of the Top 15 Cuts for Getting Started: An Easy, Tier-1 Trio + An Additional Dependable Dozen. Read on — and remember take notes as you create your 2019 seed lists! Let's begin with three cut flower varieties that play the role of focal flower — sunflowers, zinnias, and rudbeckias. This trio is widely considered a cinch to grow, whether in a backyard cutting garden like mine or for those of you venturing into flower growing for a farmers' market or local floral design customers. These features make this trio an ideal point of entry for the greenest gardeners; casual, yet entrepreneurial types exploring ways to add a tidy income stream on the side; or even experienced vegetable farmers looking to expand into commercial cut-flower production. Sunflowers form the backbone of Cuts of Colors' comprehensive grocery store program. 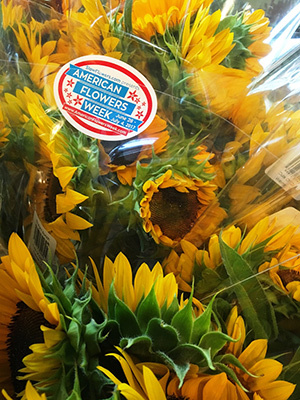 For a veteran flower farmer like Rita Anders, sunflowers form the backbone of a comprehensive grocery store program. 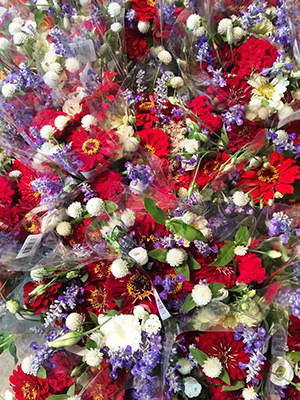 Cuts of Colors' growers' bunches and mixed bouquets fill the flower department at Houston's Central Market, where customers who once frequented Rita's farmers' market stall now make a point of shopping for her grocery bouquets year round. At a latitude just shy of 30°N, "It's easy to grow sunflowers at all times of the year," she points out. Cuts of Color's fields lie in USDA Zone 8b, with relatively mild winters (average minimum temperature 15 to 20°F/ -9 to -7°C), making it possible to start seeds quite early. "We start seed in the greenhouse, and if there's no forecast for freezing weather, we'll start transplanting around February 15th," she explains. The initial planting is followed with succession plantings every single week to 10 days until mid-September. "I count out 60 days to Thanksgiving harvest," Rita says. A Thanksgiving bestseller is 'ProCut Plum', appreciated for its rich fall tones. Other favorites at Cuts of Color include 'ProCut Orange', 'Vincent's Choice', Vincent Fresh, and Superior Sunset. "In all, we probably seed 100,000 sunflowers, with some used in our bouquets and some in our straight bunches." Zinnia blooms are an essential component in Cuts of Colors' Texas-sized bouquets. Zinnias are vigorous all-season producers that hold up well in the summer rain and heat all over the country. Two favorites include 'Benary's Giant Mix', with densely petaled blooms up to 6" across in a range of vibrant hues; and 'Queen Red Lime', with an unusual palette of antique rose-to-pink outer petals that gradually lighten through chartreuse to creamy-lime, then pop into bright, hot-pink disks in the center. 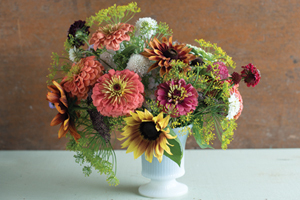 Zinnia blooms are an essential ingredient in Cuts of Colors' Texas-sized bouquets. Rita grows the Benary's Giant Series and Queen Series, and pairs them with the Oklahoma Series, which produce smaller flowers. "I like to pair a big zinnia and a little zinnia together," she notes. "The Oklahoma zinnias also have great vase life." She avoids growing and selling color mixes, preferring to bunch zinnias by bloom color for Central Market's floral customers. Rita finds that as she cuts flowers from any given zinnia plant over time, the new blooms tend toward smaller flower heads. To overcome this, she succession-sows zinnias every month to 6 weeks to ensure more robust flowers. We'll circle back to rudbeckia in the next section, but let's be clear: this is a heat- and drought-tolerant, low-maintenance staple that ranks right up top as one of the three easiest and most productive cut flowers. It blooms for weeks on end, and not in yellow alone — 'Cherry Brandy' pumps out 3–4" blooms in some of the richest, prettiest reds we know, and 'Cherokee Sunset Mix' produces large, double flowers in a warm palette of oranges, golds, bronzes, and chocolates, plus bicolors. Inspired by Hillary's mini-list of best blooms, I asked her to name a dozen additional must-grow cut flower choices. She listed flowers, herbs, and accent ingredients that each play an essential role in floral design, from focal flowers to textural fillers. As further endorsement, I asked Slow Flowers members around the country — flower farmers with a range of experience and from a number of USDA Zones and geographic regions — to share their inside scoop and personal advice on growing the diverse and enticing lineup of botanicals on Hillary's list. In their first season, the Williamses ordered Johnny's Cut Flower Kit for Market Growers. Mike and Rita Williams own WilMor Farms in Metter, Georgia, and they credit their friend Rita Anders for mentoring their farming journey. When the two Ritas get together, as they did recently at the Southern Flower Symposium, they jokingly call themselves "Dos Ritas." As newer flower farmers, the Williams grow most of their flowers from seed. They have found that following Rita Anders's advice has been essential, since their Zones are technically the same and their Georgia climate generally similar to what her Texas farm experiences. Rita and Mike initially wanted to see if they could juggle cut-flower farming as a family activity to involve their four children, ages 8 to 14. The experiment has paid off, and nowadays the family regularly brings beautiful, uncommon floral bunches and bouquets to three regional farmers' markets. In 2015, their first season, the Williamses ordered Johnny's Cut Flower Kit for Market Growers, which includes 1000 seeds each of 'Sunbright', 'Sunrich Orange', and 'ProCut Orange' sunflowers, as well as a half-ounce of 'Versailles Mix' cosmos seeds and 500 seeds of 'Benary's Giant Mix' zinnia. "It was the perfect amount," Rita Williams recalls. "Enough for us to get a taste of what flower farming would be like." The family grew everything that came in the kit, planting their one-eighth acre with several rows of cosmos, zinnias, and sunflowers, as well as celosia. The following season, in 2016, they dove right in. 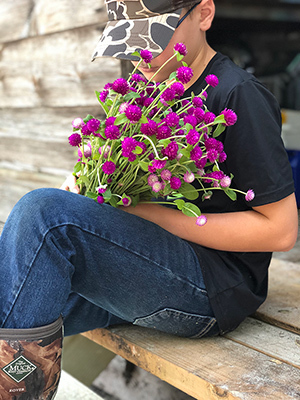 Today, WilMor Farms regularly sells mixed bouquets and straight bunches at markets in Statesboro and Augusta, Georgia, as well as in Columbia, South Carolina. Rita offers the following tips on a few of her favorites. "The one thing we hear over and over from customers is, 'Your bouquets are so natural-looking; so organic.' The plume celosia add that element." This is a crowd favorite at WilMor Farms' market stalls, Rita Williams says. "Our children call the crested version 'brain flowers,' and we joke about it being the 'smartest' flower we grow. When someone asks, 'What is this flower?' nine times out of ten they are pointing to our celosias. It's a flower that gets conversations started with customers. Plus, it adds such a distinct texture to our bouquets." The Williams do not direct-sow their celosia seeds due to a regular problem with field mice. "We plant everything in soil blocks; then we later transplant into the field," Rita Williams explains. Typically, the crested celosia (Celosia argentea cristata), is planted six-by-six, which means 6 rows with 6-inch spacing between seedlings. "We also plant some celosia closer together to produce smaller flower crests and use 9-inch spacing to produce larger-headed blooms," she says. Rita Williams raves about the plumose celosia (Celosia argentea plumosa) with equal enthusiasm. "These feathered varieties are so pretty. I don't want to call it a 'filler' flower because it does more than just fill — it gives a different texture to our bouquets. The one thing we hear over and over from customers is, 'Your bouquets are so natural-looking; so organic.' The plume celosia add that element." This season, the farm's top pick is 'Flamingo Feather,' a blush variety. "We're going to grow much, much more of that next year," Rita Williams says. Because frost rarely arrives until after Thanksgiving, WilMor Farms does a final planting of its best summer annuals around September 15th. "We start sunflowers, zinnias, and celosias in soil blocks, then those will take us through to the Thanksgiving markets," she notes. When asked to name her go-to variety of the annual black-eyed Susan, Rita Williams says she couldn't live without Rudbeckia triloba. When asked to name her go-to variety of the annual black-eyed Susan, Rita Williams says she couldn't live without Rudbeckia triloba. "I was influenced by a visit to Rita Anders's farm in Texas. After seeing her bouquets, I knew I had to be more purposeful about planting annuals that I could use as filler. What has changed our bouquets the most has been adding Rudbeckia triloba and basils." This prized rudbeckia has a main stalk with multiple side shoots bearing tiny bright yellow flowers with small, black-brown centers. Some may discount it as a filler flower, but at WilMor Farms, the branching structure enhances the floral design process. 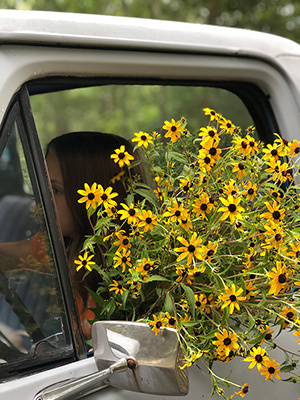 "We start our bouquets with stems of the Rudbeckia triloba and then add focal flowers between the branches," Rita Williams explains. "The children actually make most of our market bouquets!" Basil is another must-grow bouquet element for Rita Williams, echoing the enthusiasm of her mentor Rita Anders. 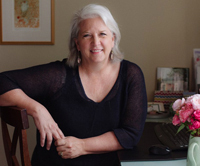 "I don't ever want to sell a bouquet that doesn't have scent again," Rita Williams declares. "We have received so much positive feedback on our bouquets with basil, and I'm glad we were purposeful growing it." 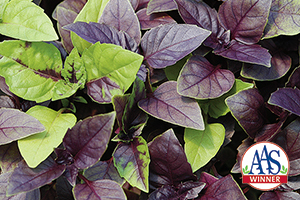 It's been nearly 60 years since 'Dark Opal' basil was named an AAS Winner, but its aromatic variegated foliage, pretty pink flower spikes, versatility and adaptability hold its spot in the cutting gardens of today. Like Rita Anders, the Williamses grow lemon and 'Cinnamon' basil varieties as cuts. After starting in soil blocks, they transplant seedlings around April 1st. "We were able to start cutting at the end of May and by September, we were still harvesting our basil," Rita Williams says. "We try to start some each month so we continually have a fresh (crop) of basil. I use the cuts without and with the flower, which adds a different feel to a bouquet. I've not had anybody complain about the flowers shedding." Rita Anders grows three types of basil for foliage: African blue basil, a sterile hybrid of two other basil cultivars, is grown from cuttings, while lemon and 'Cinnamon' basil are seed-grown. "I love the lemon basil because it smells so good," she raves. "I like 'Cinnamon' because it is licorice-y smelling and quite tough in the summer. We grow the lemon first and then add the 'Cinnamon' later in the season." Generous with its long stems and broad blooms, 'Bouquet' is a dill cultivar that wears its name with style. Rita Williams also categorizes dill as a "purposeful filler," especially successful as an early-season crop. "Oh, mercy, do people love its smell. I've found that more than anything, people associate smell with memory. 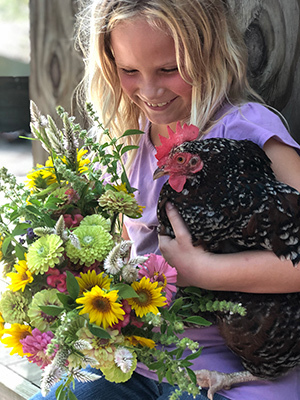 I didn't realize that about flowers when we started farming, but flowers bring back so many memories for our customers — and they want to talk about them." 'Bouquet' is an early-blooming cultivar that makes a lovely filler for cut-flower arrangements. Airy chartreuse flowers appear as highlights and combine well with almost any color arrangement. Comprised of long-flowering, long-lasting, taller ageratum cultivars, 'Timeless Mix' lends itself well to the cutting garden. While often considered a bouquet "filler" for its small, lavender puff-of-a-flower, ageratum also has excellent foliage, Rita Anders says. "Ageratum has such beautiful leaves on it." 'Timeless Mix' features a blend of taller cultivars with a long flowering period, making it a perfect choice for the cutting garden. Upright, sturdy stems produce tight clusters of flowers in purple, pink, blue, and white. A great gap-filler in bouquets. In Potomac, Montana, about 25 miles east of Missoula, Carly Jenkins and Jamie Rogers grow cut flowers at Killing Frost Farm. The farm is located in Zone 4b (average minimum winter temperature -20 to -25°F / -29 to -32 C). When it comes to amaranth, "I don't pinch," says Carly of Killing Frost Farm; "I just let the plants be huge and cool." Here she is with 'Red Spike'. 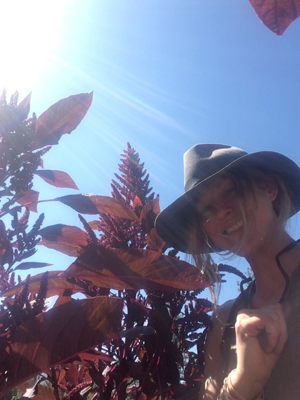 When I called Carly to ask her about best cut flowers to grow from seed, she sang praises to amaranth. "I feel like anyone who is buying amaranth for a cut should check out the seeds that Johnny's has in bulk," she insisted. "You get such a great deal and you should plant it all." Carly starts some of her seeds in cell trays to coordinate her succession plantings in prepared rows. She also finds bare spots around her property for leftover amaranth. "I just toss them around. It's crazy, but those seeds will take root wherever you toss the seed and just do their thing. I plant where I know they will get some moisture. I've even thrown seeds on patches of snow, because I know the soil is bare underneath. I just let nature take its course and now I have little amaranth forests everywhere!" She likes to grow 'Red Spike' and 'Hot Biscuits' (Amaranthus cruentus) and the trailing 'Love-Lies-Bleeding' (Amaranthus caudatus) varieties. "I don't pinch; I just let the plants be huge and cool. In the fall, I harvest and dry them for use in foam-free floral installations." The drying process mellows the colors, to Carly's delight. "Love-lies-bleeding dries to a color that's even more beautiful than when it's fresh. It's a dusty pink." 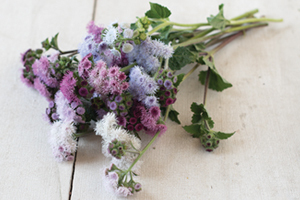 'Dara' produces abundant, attractive, lacy umbels in shades of dark purple, pink, and white. "As soon as the ground is workable, in mid-May, I direct-sow ammi and daucus. I had really good results with them this year," says Carly Jenkins. "I also overwintered a bed of ammi where I planted seeds last fall and that worked pretty well, too." 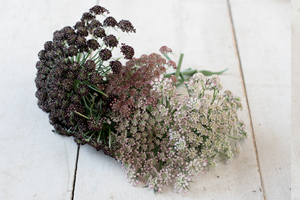 With its long-lasting blooms, ammi makes an outstanding cut-flower filler. 'Dara' is a highly productive Daucus cultivar with 7–15 strong, sturdy, upright stems per plant topped by attractive, lacy umbels in shades of dark purple, pink, and white. The Rocket Series and Potomac Series (our custom 'Potomac Mix' shown above) are categorically group 3–4, "main season" snapdragon types, meaning they perform best in late spring through summer into early fall, when light levels and warmth are at their peak. See our Snapdragon Tech Sheet for more information. "Snaps are a big producer for us — and one we can cut on for the whole season," Carly Jenkins says. "I stick to the classic Potomac Series and 'Rocket Mix'. The stems stay strong enough through the second and third cuts — they are workhorses." 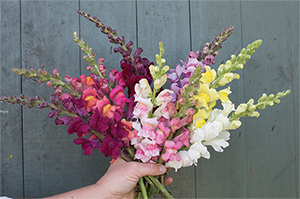 Killing Frost Farm's customer base includes brick-and-mortar flower retailers who like the standard snapdragons. "There's nothing like locally-grown snapdragons," Carly Jenkins says. "That is one of the most painful flowers (for me) to see shipped. I've processed them for florists for whom I've freelanced. When snaps are shipped in a box, they are so smashed and compressed. They don't even look like the same flower as my fresh-cut snaps." She describes beginning her snapdragon seeds as follows. "I start them in an open flat and sow the seeds like you would microgreens, so I get a carpet of seedlings. Then I prick out the little guys once they get their first set of true leaves and bump them up into plug trays." While that may seem like a lot of labor, Carly says the method works for her. "It's a space-saving technique for me because I don't have a huge seed-starting area. I can start the open flats under lights and then in a month, when I'm ready to bump the seeds up to cell trays, it has usually warmed up enough to put them in the transition house, where they are covered but don't have heat." Carly zeroes in on the needs of wedding and event florists with lots of white, cream, pale yellow, and blush options. Carly Cavalier rents land in Washington's Skagit Valley where she grows about a half-acre of cut flowers as Cairn Farm and sells them primarily through the Seattle Wholesale Growers Market (SWGM), a farmer-to-florist wholesale hub. Carly previously worked at SWGM so she draws from that experience, with insights into the preferences of area designers and florists. "I saw what would sell and what didn't sell, color-wise," she says. Carly zeroed in on the needs of wedding and event florists, making sure to have lots of white, cream, pale yellow, and blush options in her crop planning. "I grow dahlias, carnations, strawflower, ammobium, verbena, feather-top grass, and zinnias (Oklahoma, Profusion, and Persian carpet). I also grow smaller-headed and lighter-colored sunflowers, as well as a few rows of marigolds in different colors, cress, amaranth, larkspur, cosmos, feverfew and heirloom mums." It's easy to see why Carly Cavalier's outsized bouquet of 'Silvery Rose' strawflowers won accolades on Instagram. 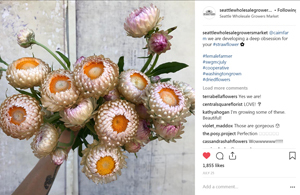 She had no idea how well her strawflowers would be received, but one look at the SWGM's Instagram feed speaks volumes. A July post featuring a bunch of 'Silvery Rose' strawflowers garnered more than 1,800 likes. "I was kind of taken aback over how big a deal strawflower became this season. It's definitely become one of my top crops," Carly Cavalier says. "It looks cool when it's fresh; you can also dry it, which opens up a whole new world of possibility for the crop. 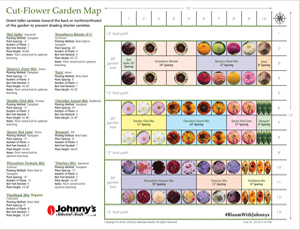 I grew Johnny's 'Vintage White', 'Silvery Rose', and 'Apricot/Peach Mix' strawflower seeds. I also bought seeds of a vintage white variety from a woman in Ireland." 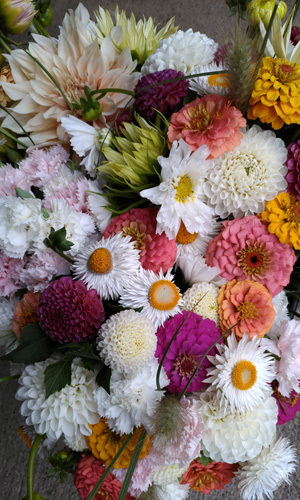 She earmarked the single-color strawflowers for florists and offered mixed strawflower bunches to grocery channels. "The nice thing about strawflower is that anything we don't sell at the end of the week, I take home and hang up to dry," Carly Cavalier explains. "At the end of summer, I bring it back to the market as dried strawflowers, when customers are looking for materials to make fall wreaths." She uses soil-blocking to start strawflower seeds, with 50 blocks per tray. "There was one variety that didn't have a great germination rate on the packet, so I seeded two or three seeds per block and it seemed to work out fine." The trays go from heat mats to lights, then Carly moves them outside to a low hoop tunnel before planting into prepared rows. "The only thing I would recommend is staking it, with netting, because of the wind's tendency to knock it over. I'll definitely do that next year." 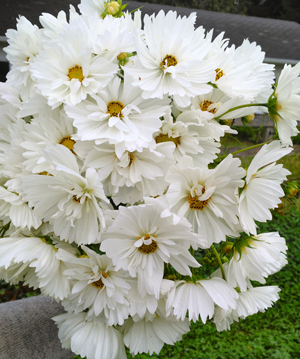 Cairn Farm's 'Fizzy White' cosmos are always in demand for weddings. Cosmos are another of Cairn Farm's bestselling cut flowers. Carly Cavalier grows primarily white choices, which are always in demand for weddings. "They are prolific; they will bloom all summer long — producing lots and lots of blooms," she acknowledges. "But the challenge with cosmos is when to cut them." Carly has found that harvesting cosmos when the flower has a tight center ensures the longest-lasting cut flower. "The latest I'll cut is when the outer ring is just beginning to show. As soon as the center's fully blown out, the yellow pollen just shatters." She cuts on a regular schedule to stimulate production. "I keep on top of them by cutting three times a week. I cut Sunday, Tuesday, and Thursday, and then I deadhead everything on Friday. By Sunday, again I have more blooms. Since I keep cutting, they keep blooming." The large, double blooms of 'Double Click Mix' feature deeply fringed petals in a lively range of colors, including carmine, pink, and white with sunny yellow centers. These dance atop tall, well-branched stalks of fernlike foliage that also makes a fine green bouquet filler. Here are the final three on our list that you'll want to check out, along with Johnny's recommendations. Be sure to check the extensive Flower Production Guides in the Flower Grower's Library for detailed planting and harvesting instructions. 'Pincushion Formula Mix' scabiosa produces tall, sturdy plants topped by rounded, lacy masses of tiny florets in a diverse, well-balanced palette. 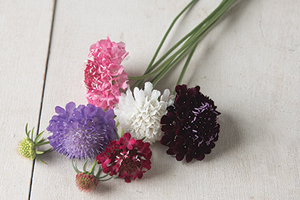 Scabiosa, also known as mourningbride and pincushion flower, is a versatile cut flower. With its spiky ball center and strong wiry stems, it can be used fresh or dried. Some varieties form decorative seed pods that resemble shuttlecocks, adding whimsy and interest to mixed bouquets and arrangements. 'Pincushion Formula Mix' features elegant, button-like flowers in rich "black," lavender-blue, butter yellow, bright red, salmon rose, and white on durable, wiry stems. Easy, reliable, and beautiful — cut regularly to keep them coming. Gomphrena are easy-going flowers and tolerant of hot, dry weather. Also known as globe amaranth, the well-branched, upright plants of gomphrena produce clover-like blooms continuously all summer. And much like the true Amaranthus species described above, globe amaranth are relatively undemanding in their culture, and tolerant of hot, dry summer weather. Regular harvesting promotes flower production. Grows well in beds and rows for large-scale production. Also known as thorow wax and hare's ear, bupleurum grows quickly and easily, and adapts well to growing in many environments. Its erect plants produce 2–2½" yellow to lime-green flowers in umbels atop long, thin wiry stems. Though it shows up last on this list, it is not just an easy choice — bupleurum's airy, fine texture makes it a classic, highly versatile filler in cut-flower arrangements — which is why it additionally ranks as one of our Flower Farmers' Favorite Foliages & Fillers. For anyone who has made it all the way to the bottom of this article and wants to get started, consider one or the other of Johnny's convenient, pretrialed sets/kits for entry-level floriculture. Selected and designed by Hillary Alger, Johnny's Flower Product Manager. This map demonstrates a sample cutting-garden design for a 10'x13' rectangular plot, sufficient to accommodate our Easy Cut-Flower Garden Set. For larger garden plots, apply the same design principles and plant spacing, but increase the number of plants to fit your garden space. Easy Cut-Flower Garden Set. This set includes nearly a dozen of the easy-care flower and herb varieties listed above, in a range of colors and textures, to yield a handsome mix of cuts all season long. Can be purchased individually or as a complete set. Accompanied by a detailed Garden Planner and Garden Map, in which Hillary sparks the imagination with bouquet tips and recipes using the focal, accent, filler, and spike ingredients included, and lays out all the practical details needed for getting your plant spacing and quantities down pat. This is the ideal choice for home gardeners. Cut Flower Kit for Market Growers. For those with a little more time and space to invest, this kit provides seed sufficient to plant an approximately quarter-acre plot with proven varieties of cosmos, sunflowers, and zinnias for bringing to market. 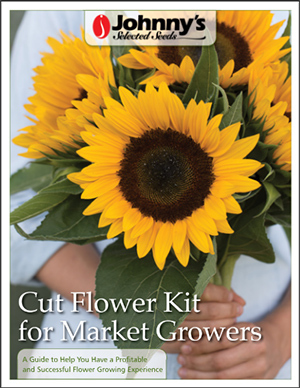 The kit is accompanied by our Cut Flower Kit Growing Guide, a 5-page informational brochure detailing the basics of cut-flower growing for profit, growing instructions, and a sample planting guide.